Where you can make a run for it, do so – there is nothing heroic about hand-to-hand combat with the dead. But if you’re going to stand your ground, never attempt to face the undead in unarmed combat if there is a weapon to hand. Grab what you can and use it! Here are a few examples you may not have considered. On underground going to work? Use the train doors to crush the zombie’s head. If they are already in the carriage, grab a shopping bag and swing it round Wild West style. Kick the zombie off the platform towards an oncoming train. Of course, this would delay your trip. Throw expensive spirits on the zombies and then skilfully flick a match. Saving that, a frozen turkey to the head is a powerful clubbing weapon. If you are a sports fan and have the skills, you may be able to take a zombie down by throwing a can and hitting the ghoul in the head. Throwing piles of dusty hymn books will knock the dead over from a distance. Try to use the ones with musical guidelines as they tend to be thicker. If your priest is Irish, he may be quite handy himself and will be able to support you in any combat. This is a complete system of combat specifically designed for use against zombies. Thought to originate in the monasteries of the Wudang Mountains in China, this highly skilled art has an emphasis on rapid hand work and short kicks, many of them low. Little is known of this art in the West and it has tantalised martial fanatics around the world to hear of the moves such as Sarm Bo Jin, which literally means ‘Three Step Arrow’. The few accounts we have compare the style to that of a graceful street fighter. 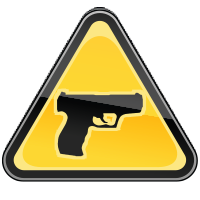 If you can obtain training in this art then this is the perfect preparation for the zombie apocalypse. According to Chinese zombie experts, an elderly monk known only as Zhang Sanfung is the only living master of the Southern Praying Mantis. Once a fighter has mastered the basic moves in combat, there are hundreds of more advanced techniques that can be learnt. Some will take months of practice, but many offer breathtaking alternatives to use in action, with moves that can save lives and take out multiple zombies at a time. Start your training by learning basic kick moves. 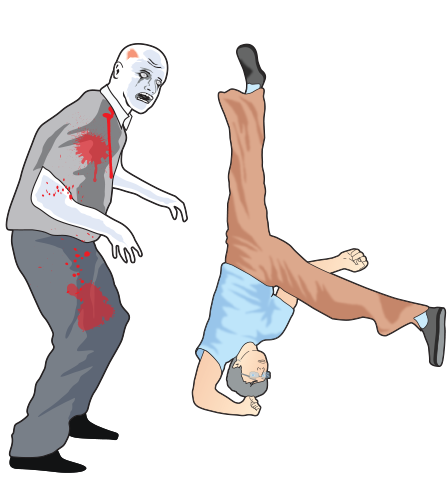 A simple kick to the chest will often send a zombie tumbling to the ground, but ensure that you have the balance to stay on your feet before trying to kick any higher – remember the core principles of combat against the undead – balance, clear mind and room to escape. Much maligned in normal self-defence for leaving its proponent vulnerable to counter attack, against the undead a well-placed kick can knock a zombie down, and in the cases of extremely desiccated creatures take their heads off completely. The user must be fit and limber to use this move. 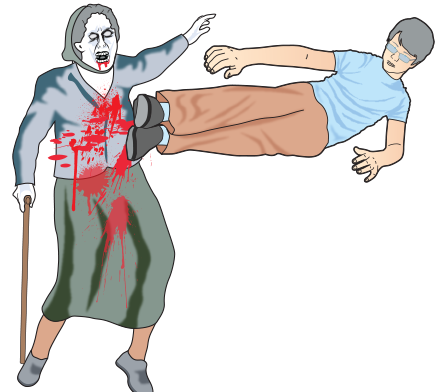 Pulling a muscle in unarmed combat against the dead will reduce the principal advantage you have over the zombies, which is your speed. This move is specifically designed to knock down multiple undead opponents. The fighter swings their legs back before jumping high into the air to deliver their first blow. Using the momentum of the swing, the leg should then follow round, hitting one target after another in a circular motion. All of the momentum will be driven into your lead or landing leg to deliver the multiple blows. It can appear as if the fighter is ‘floating’ so this is one impressive move. This is an advanced move that requires great agility, but it can deliver a powerful, even knockout, blow to a zombie. Users require a good run up followed by a flying leap towards the undead opponent. The two feet should land squarely on the chest and the force will send the ghoul tumbling backwards. A disadvantage of this technique is that the user is left prone and vulnerable on the floor for a few seconds. However, it can be most useful if a zombie is threatening multiple targets and you just need to get the creature well away, for example from children or wounded. This is basically a forward somersault, normally with hands. 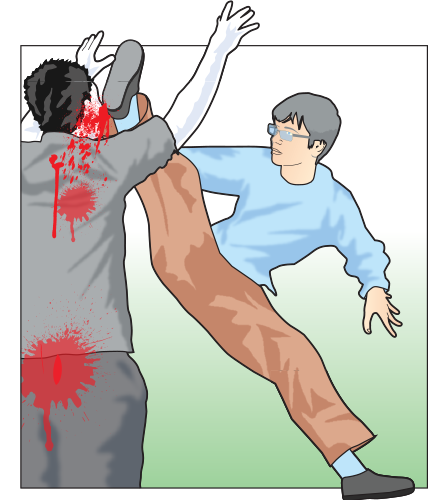 The kicking leg swings over the top and lands with incredible force on the top of the zombie. The trick is to kick up your back leg as you take off. As your body gains velocity, the leg flips forward causing the body to flip and the foot to come down with skull-crushing force. This is really a show move and any slip-ups will leave you prone to counterattack by your ghoulish opponent. However, pull it off and you will appear to any watching survivors to be the post-apocalyptic equivalent of Bruce Lee.